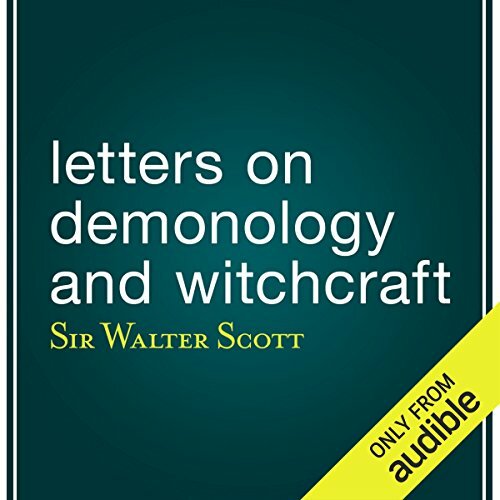 In Letters on Demonology and Witchcraft, Sir Walter Scott rationally explores the existence of supernatural phenomena like ghosts and witches. One wouldn't expect an internationally acclaimed author raised in the glow of the Enlightenment to believe in apparitions, and in this audiobook Scott debunks ghost stories, witch trials, and demons with slightly amused conviction. Erik Brooks performs this epistolary work with deliberation and a lingering pronunciation that helps tether Scott's complex prose. This is one of the great Scottish author's last books, for he died three years after his son-in-law urged him to write it while Scott recovered from a fit of apoplexy. Letters was written when educated society believed itself in enlightened times due to advances in modern science. Letters, however, revealed that all social classes still held beliefs in ghosts, witches, warlocks, fairies, elves, diabolism, the occult, and even werewolves. Sourcing from prior 16th- and 17th-century treatises on demonology, along with contemporary accounts from England, Europe, and North America (Cotton Mather's Magnalia Christi, for one), Scott's discourses on the psychological, religious, physical, and preternatural explanations for these beliefs are essential for acolytes of the dark and macabre; the letters dealing with witch hunts, trials (Letters Eight and Nine), and torture are morbidly compelling. Scott was neither fully pro-rational modernity nor totally anti-superstitious past, as his skepticism of one of the "new" sciences (skullology, as he calls it) is made clear in a private letter to a friend. Thus, Letters is both a personal and intellectual examination of conflicting belief systems, at a time when popular science began to challenge superstition in earnest. As an academic resource this is a great book. However, it lacks any real narrative and seeks to "debunk" each and eery aspect of the supernatural. Which is okay, but not as interesting as the social and cultural effects of "demons and witches." What was most disappointing about Walter Scott’s story? The dry, non-committal description. The prose is lackluster and laden with opinion and attitude not story. What three words best describe Eric Brooks’s performance? Did Letters on Demonology and Witchcraft inspire you to do anything? I expanded my research several degrees and was able to pinpoint a time period in which I was going to do more research. Get the print version - this is a seek and cite book for academic purposes, not a story book for entertainment. I'd gladly add it to my shelves but the audio version is a bit harder to cite. The audio book cut off--paused itself--after a few minutes. When I pressed the pause icon on my Kindle Fire to continue, the narration started over from the beginning. I hoped it would continue past the point where it had paused last time but no, it "paused" at the exact spot (in the middle of a word, no less) and started at the beginning again when I pressed the icon. That is my main gripe. My second is that the narration is monotonous and stilted, pausing for long moments at every comma. As Sir Walter Scott wrote these letters around 1830 or so, the style of most of the sentences is long, with many additional clauses (calling for many commas) that either add to the sentence's original intent or divert it into another area altogether. A good narration might be able to overcome this style of writing and make it pleasant to the ear, but in this recording, by the time the sentence comes to an end, the listener has forgotten the beginning. This recording should probably be skipped by the modern listener.